Join us in celebrating our 150th Anniversary! Abraham Lincoln was in his first year of his presidency when this church was built in 1861. In that year the Transcontinental Telegraph was completed connecting the eastern part of the United States with California. Also the United States government issued the first paper money by acts passed in the year of 1861. The population of our country in that year was 32,351,000. Eleven southern states succeeded from the Union taking over 9,000,000 people to form the Confederacy to being the Great Civil War on April 12, 1861. More than 600,000 Americans would die during the four-year conflict. Our United States Flag had 33 stars when Abraham Lincoln became our 16th president. It is hard to believe that one human being could still legally own another human being when this church was built. The Emancipation Proclamation freeing the slaves wouldn't happen until January 1, 1863. The earliest known church members were Jacob and Catherine (Stahl) Weimer in the year of 1842. More early members were Peter and Lanah (Phillippi) Zufall and Johan and Sarah (Phillippi) Enfield in 1843. Lanah and Sarah were sisters. Before this church building was built, the members would have met in each other's homes. One wonders if the name Mt. Union was in honor of the union of the United States. John and Roseanne Zufall sold 1/2 acre of land to build the Mt. Union Church for $15.00. The deed was recorded on October 7, 1861. The church is 30 x 40 with a seating capacity of 150 persons. The timber is hand hewn and hand planed. Peter Zufall was known as a master carpenter. He built the pews you are sitting on. His son, William, built the pulpit. Many of the glass panes in the windows are the original glass from 1861. Notice the waves and bubbles in the glass that was very common in glass making at that time. The Turkeyfoot Trail Road, the road between the church and the cemetery, was the original road that connected Confluence and the southern end of Somerset County with the county seat at Somerset. All of history passed by this [church] for many years. Over the years, many great revivals were held with as many as 100 persons in attendance. Some of the church members remember when the church was full for these services. Before 1912, Mt. Union was on the Rockwood Charge. Mt. Union was always called the "Mother Church" for it was the oldest congregation. After 1912, Mt. Union was on the Casselman charge with the following churches: Casselman, Mt. Zion, and Markleton. In 1946, the United Brethren in Christ, which Mt. Union always was, and the Evangelical Church merged together to make the Evangelical United Brethren Church or as they were called, the E. U. B. Church. Around that time the Harnedsville Church was added to the charge to make 5 churches on the charge. United States Congressman J. Buel Snyder donated the funds to have the electric lighting installed in the church in the early 1940's. His childhood home was the farm just below the church. J. Buel was the grandson of Peter and Lanah Zufall, early members of the church. The Evangelical United Brethren Church merged with the Methodist Church in 1968 to create the United Methodist Church. Because of decreasing membership the small congregation could no longer continue having church. The Mt. Union United Methodist Church closed it's doors in 1970. Several years after the closing of the church, the Leaphart Family began to make plans to buy the church and form the Mt. 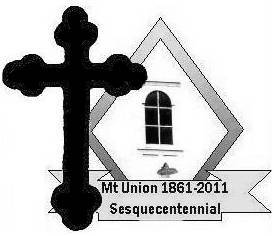 Union Church Association Incorporated. Today, this group maintains this church for special services, weddings and funerals. This church is solely maintained through donations. If you would like to make a donation, please send it to C. Brocht, 1428 Casselman Road, Rockwood, PA 15557 or call 814-926-3142. Any gift is greatly appreciated. Thank you for visiting the church. It is our prayer that you will always find a blessing here and that you will come to visit us again and again. Copyright 2007-2011. Mt. Union Church Association, Inc All rights reserved.